A few myths have developed around this feature, one of the most common being that the deeper the punt, the better the quality of wine. Although it is more costly to use bottles with deep punts and so it is most likely that the wine will be of good to exceptional quality, this is not always the case. 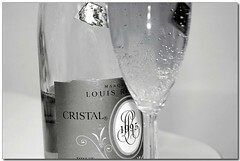 Conversely, one of the most famous Champagnes in the world, Cristal, does not have a punt at all – the bottom is completely flat. In 1876 Tsar Alexander II of Russia who first commissioned the Champagne for his court was (justifiably) concerned that he would be poisoned. The famous punt-less clear glass that Cristal is packaged in was designed specifically to enable detection of any poison in the Tsar’s drinks! A further feature is that the punt helps to strengthen the glass at what would be its weakest point – so don’t go dropping any bottles of Cristal you have lying around! The final use of the punt is a very useful purchase for the thumb when pouring, a trick many a sommelier will utilise! I think the most important reason for the punt is to allow the bottle to be stood on an uneven surface, such as a rock at the seaside or a shaggy carpet at the fireside.